As we charge headlong into the summer, the variety and complexity of projects is increasing. Crosswords have become an occasional feature of the evenings, the cryptic nature stirring discussions sometimes of a metaphysical nature, other times, philosophical. A session on sharpening has again proved useful for participants and some of us can claim to have a rudimentary understanding of grain direction. Call back soon to see the progress of the Buddha (enlightenment guaranteed) and yet more new emergent projects. 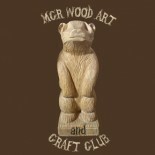 This entry was posted on June 8, 2014 by mcrwacc in wood carving and tagged adult learning, art and craft, carved medieval foliage, carved window frame, club, craft club, drawing, life long learning, manchester, night class, sculpture, wood carving.